The property occupies a central position within a no through road known as The Crescent. 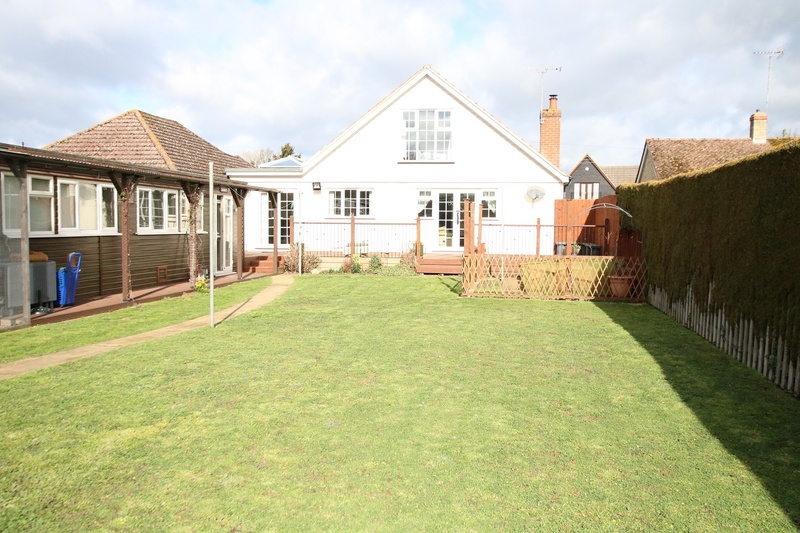 The Crescent is situated within the parish of Barham within walking distance of the bus stop and attractive village pub. 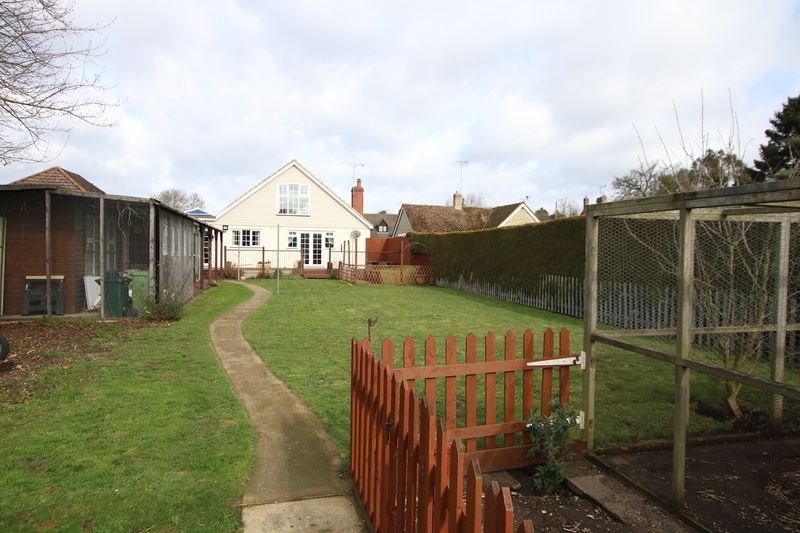 The larger village of Claydon is approximately half a mile away providing a range of shops including post office, pharmacy, hairdressers, public houses and primary and secondary schooling. The Suffolk county town of Ipswich is approximately three miles distant offering a much wider range of facilities including mainline railway link to London's Liverpool Street. The A14 trunk road offers access in an easterly direction to the A12, Ipswich and Felixstowe and in a westerly direction to Bury St Edmunds, Cambridge and on to the Midlands. 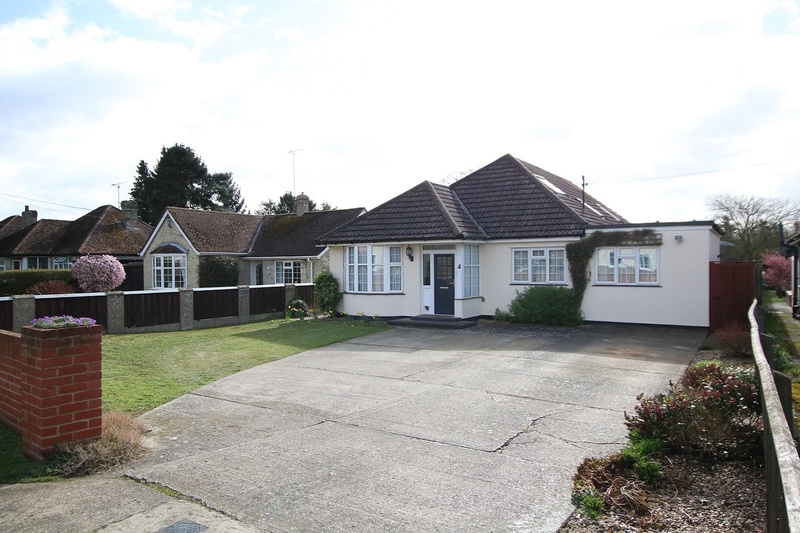 This exceptional bungalow has been the subject of an extensive refurbishment, upgrading and re-modelling program which has included extensions to the side, rear and first floor to provide well planned extensive and flexible accommodation, finished to the highest standards throughout. 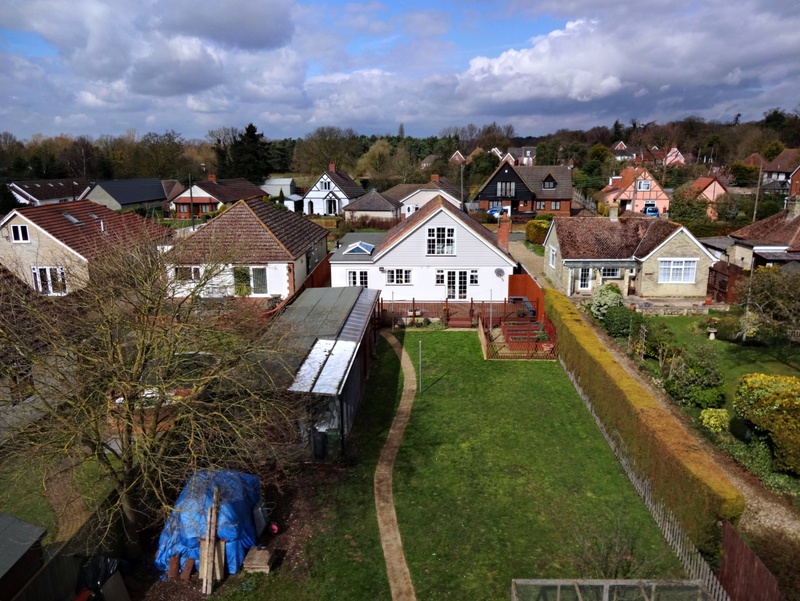 Features include a 25' long reception hall giving access to three ground floor bedrooms as well as spacious shower room, the sitting room and kitchen are located to the rear with views over the garden, the sitting room has feature fireplace fitted with a wood burning stove. 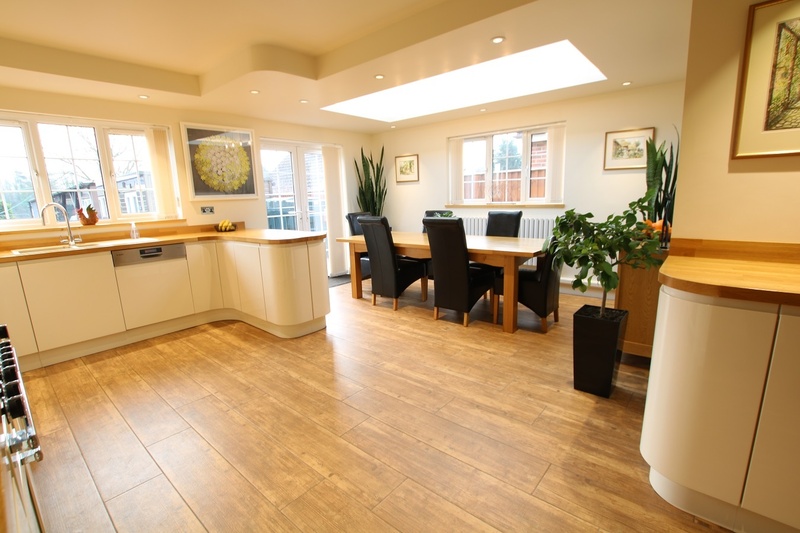 The amazing live-in kitchen/dining/family room offers a bright and airy room with good amounts of natural light with feature roof lantern and an extensive range of kitchen units, this is complimented by a separate utility room. 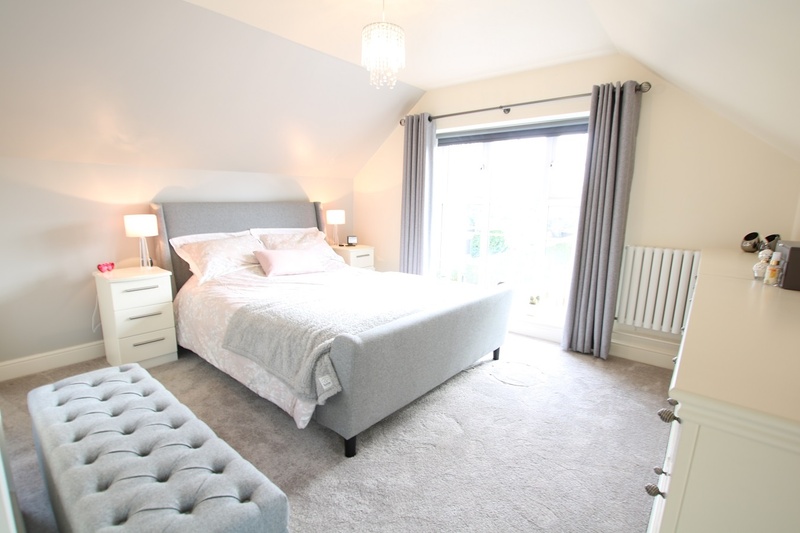 On the first floor there is a most appealing master bedroom with large picture window overlooking the rear garden and access to a full size bathroom which in turn leads to another double bedroom. 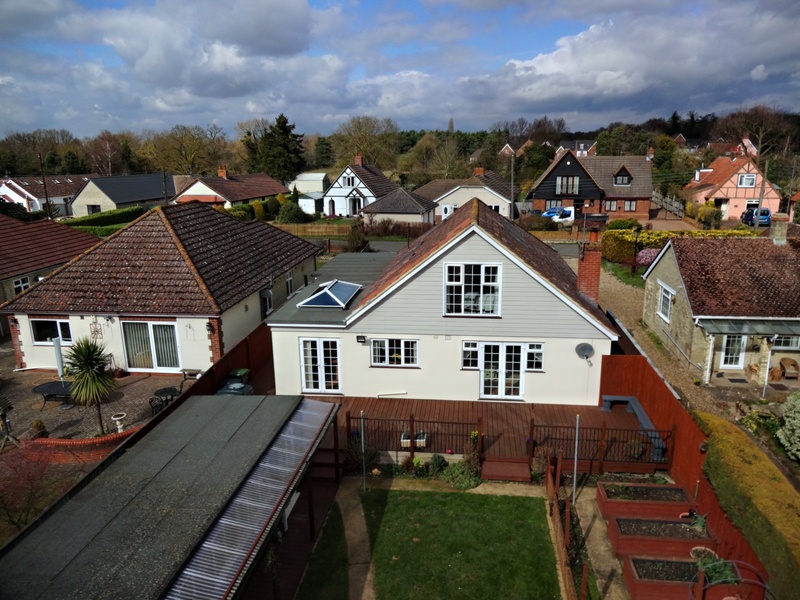 Overall the property is superbly presented throughout, ready for immediate occupation with high quality fixtures and fittings. 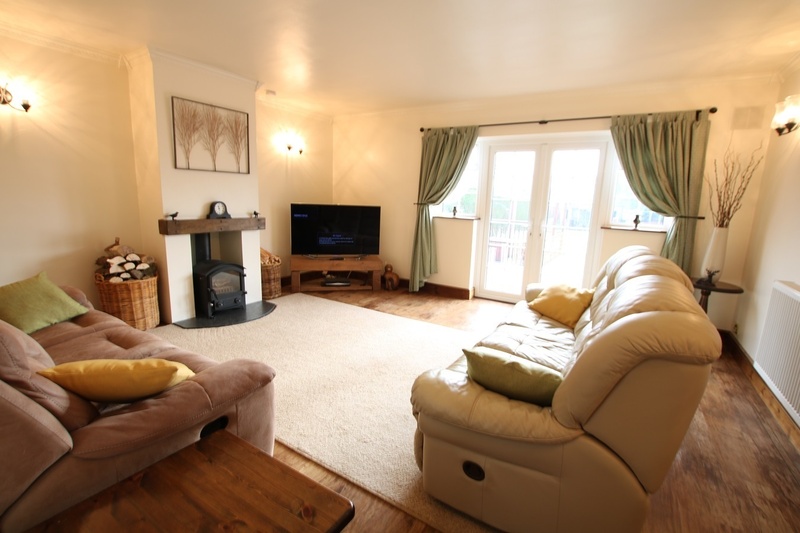 Internal viewing is essential to fully appreciate the size and quality of the accommodation on offer. ENTRANCE PORCH: PVC double glazed entrance door, radiator. 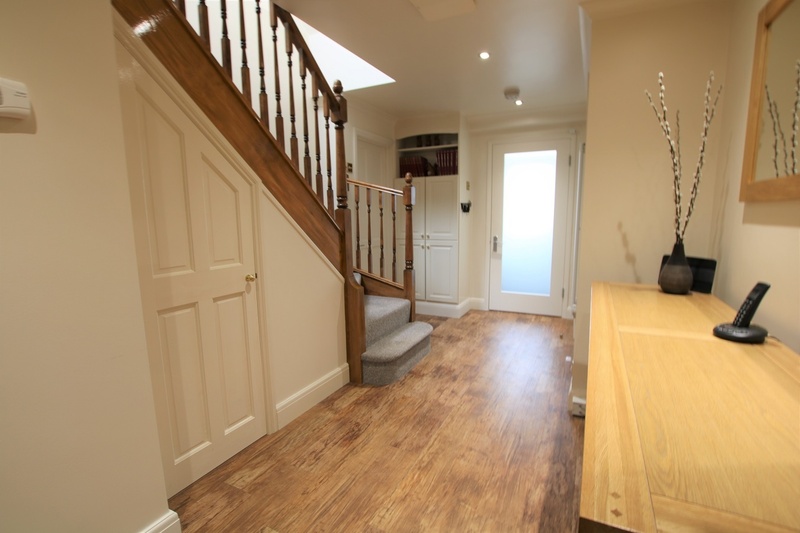 25' 0" x 7' 0" (7.62m x 2.13m) Two contemporary radiators, built-in understair storage cupboard, wood effect flooring, staircase to the first floor, inset spotlights, purpose built shelved shoe cupboard. 17' 0" x 15' 2" (5.18m x 4.62m) Chimney breast with decorative wooden mantle and granite hearth inset with wood/multi fuel stove, wood effect flooring, radiator, tv point, PVC double glazed French doors opening to the rear garden. 25' 0" x 18' 0" (7.62m x 5.49m) At the longest points. Fitted with an extensive range of contemporary style high gloss base and wall mounted units including feature curved units, thick oak worktops inset with one and a half bowl stainless steel sink unit with mixer tap, feature chimney breast with inset range cooker, glass back and extractor, integrated Bosch dishwasher, space for American style fridge/freezer, inset spotlights, further full height storage cupboards including larder unit, porcelain wood effect floor tiling, feature ceiling lantern, flush mounted inset tv, door leads to the utility room, PVC double glazed windows and French doors to the rear aspect. 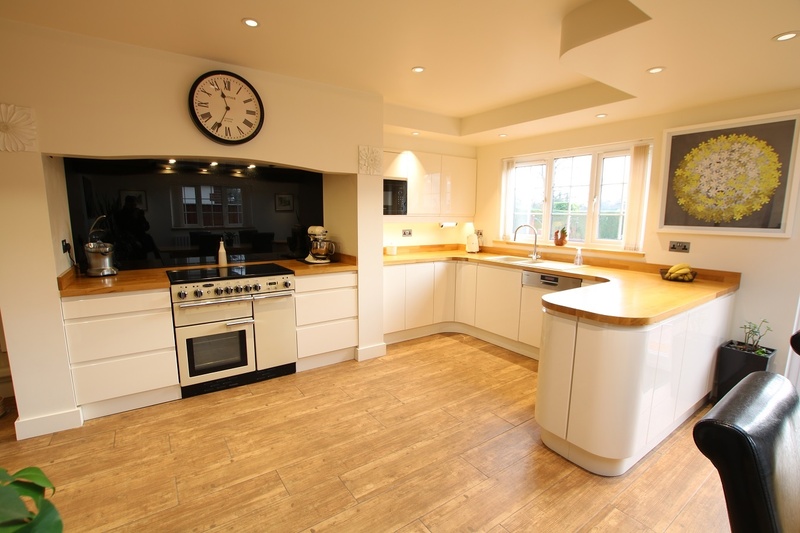 11' 2" x 7' 9" (3.4m x 2.36m) Good range of built-in storage cupboards, fitted worktop, plumbing for washing machine, floor standing oil fired boiler, porcelain wood effect tiled floor, inset spotlights, PVC double glazed door to the side aspect. 18' 1" x 13' 0" (5.51m x 3.96m) Radiator, extensive range of built-in bedroom furniture including wardrobes and drawer units with solid pine panelled doors and drawer fronts, inset with fitted shelves and hanging rails, two PVC double glazed windows to the front aspect. 13' 2" x 11' 8" (4.01m x 3.56m) Radiator, coved ceiling, feature PVC double glazed bay window to the front aspect. 11' 0" x 9' 0" (3.35m x 2.74m) Radiator, decorative dado rail, PVC double glazed window to the side aspect. 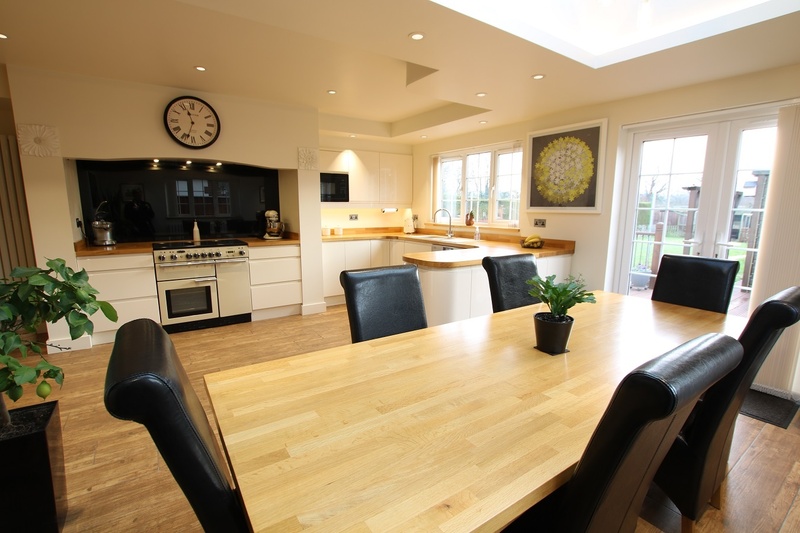 Bright & airy with two velux roof lights, one high level and one low level, built-in shelved shoe cupboard. 13' 0" x 11' 3" (3.96m x 3.43m) Plus door recess. Built-in low level storage cupboard, radiator, telephone and tv points, low level velux window, attractive PVC double glazed picture window with views over the garden and beyond. 14' 2" x 8' 5" (4.32m x 2.57m) Radiator, tv point, low level eaves storage cupboard, two velux windows to the side aspect. 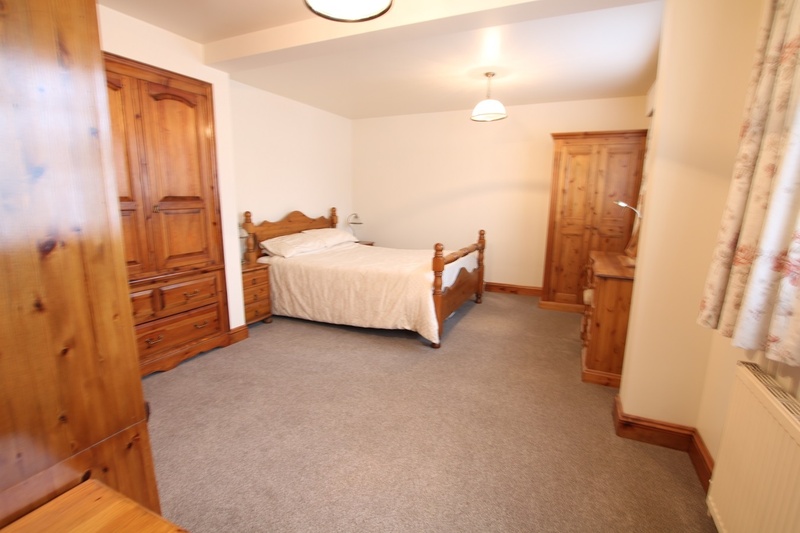 8' 6" x 6' 3" (2.59m x 1.91m) Serving both first floor bedrooms. 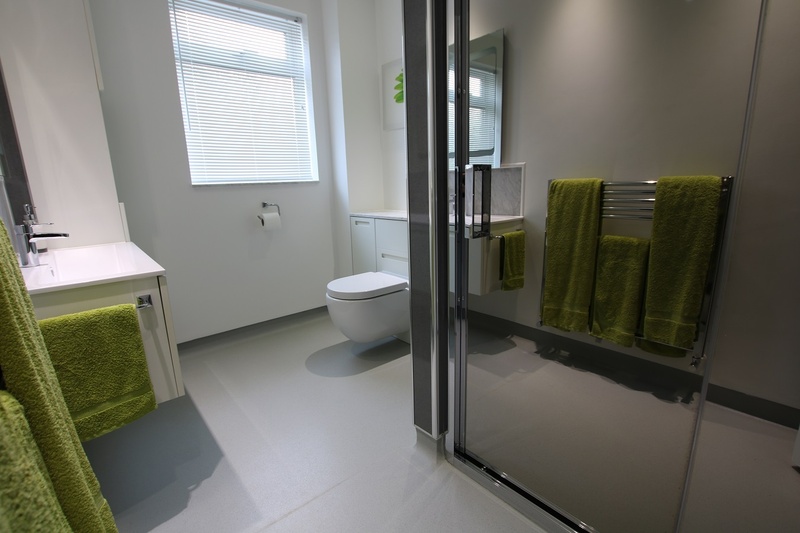 Large deep and wide bath with shower connected over, granite style shower board, low level wc with concealed cistern, built-in vanity unit with ceramic wash hand basin with mono tap and storage cupboards below, towel radiator, non slip flooring, velux roof window to the side aspect. 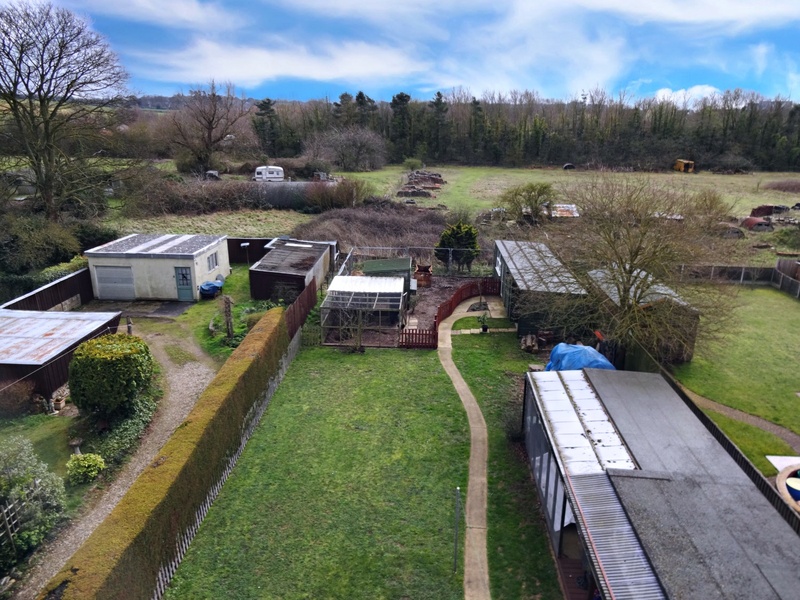 To the front of the property there is an extensive parking and turning area providing space for several vehicles or perhaps caravan or motorhome space. 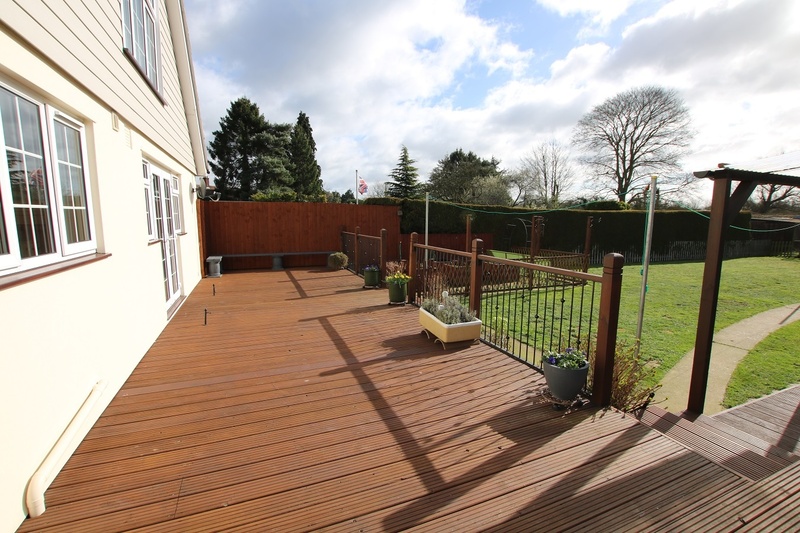 Pedestrian access leads to the rear garden, which is in excess of 140ft in length. 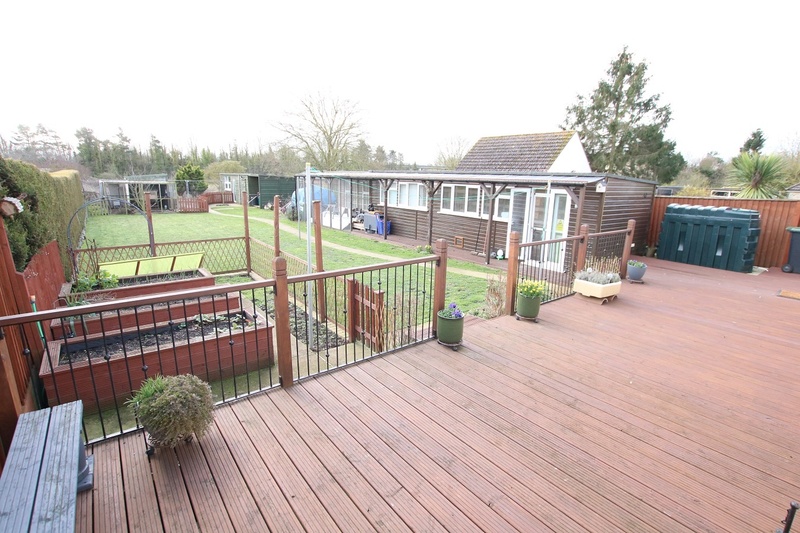 Immediately to the rear of the bungalow there is a large raised deck, raised timber planters. The gardens are predominately laid to lawn with sizeable detached timber workshops and aviary. To the far end of the garden there is an enclosed chick run and hen house, further detached workshop.